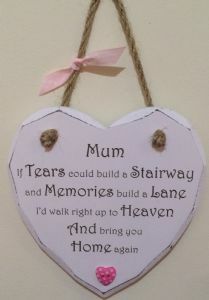 Laquered on both sides, this is a beautiful white wooden plaque with a lovely engraved quote. Individually hand finished with a pretty embellishment, then hung with natural twine and a complimentary coloured polka tie. Perfect to let someone know you are thinking of them. Heart Plaque 13.5cm x 14cm. 21cm when hung.